Delicious Pepperoni and String Cheese Roll Ups make the perfect snack for entertaining, game time or anytime. An easy DIY snack recipe tutorial idea. Preheat oven to 350 degrees. Take each triangle of crescent roll dough and place about 6 pepperonis on the bottom of the triangle. Place half of a cheese stick on top and roll up. Place seam side down on a cookie sheet and bake for 10-14 minutes or until golden brown. While rolls are cooking, combine the melted butter, Italian seasonings, garlic powder and Parmesan cheese in a small bowl. When rolls are done remove from the oven and brush with the garlic butter glaze. Serve with marinara or ranch for dipping. 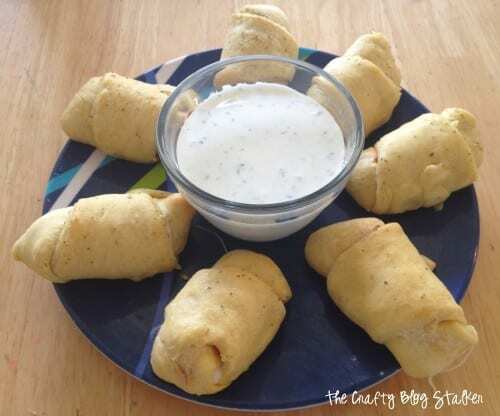 I dipped them in my Best Homemade Ranch Recipe and they were AMAZING! I doubled the recipe and had some leftover. I put them in the microwave for 30 seconds the next day and they were still AMAZING! Do you have a favorite guacamole recipe? Share and leave a comment below! 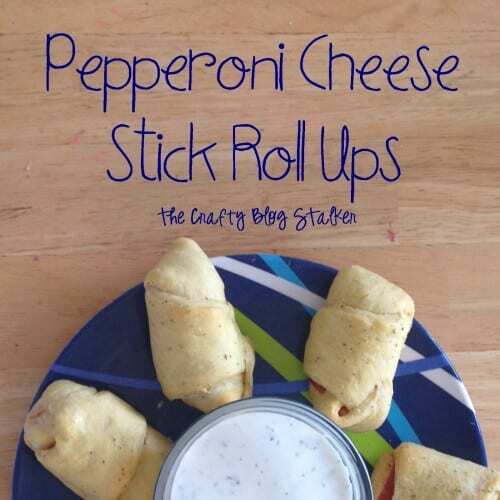 SAVE HOW TO MAKE PEPPERONI CHEESE STICK ROLL UPS TO YOUR FAVORITE RECIPE PINTEREST BOARD! These look like such a great snack!! Thanks for linking this to Things I’ve Done Thursday! These look like they would go in a flash. Yum. Thanks for sharing at our party this week. What a great little snack or appetizer! 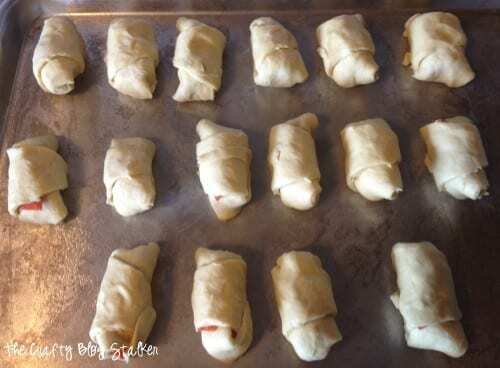 I make pizza rolls too, but I always use homemade pizza dough – using the crescent roll dough is a great shortcut!!! Thanks for the tip!!! Want some now! These look so super yummy and I’m sitting here waiting for my dinner to finish and NOW my tummy is growling at my monitor! lol Pizza anything is my favorite! Thanks so much for stopping by Creative Thursday last week. I couldn’t do these parties without you. Can’t wait to see what you link up this week. Have a great week. yummy. must add this all to my grocery list! Stop by and link up if you have time! Looks yummy! Thanks so much for sharing at Terrific Tuesdays. Oh my! My boys would love this dipped in pizza sauce! Pinned! Thank you so much for stopping by “All my Bloggy Friends” … I hope you have a great weekend and will stop by next week! Mmm! Definitely a good snack to try! I know my husband would love these!